﻿ The Blossom Resort Danang, Da Nang | FROM $33 - SAVE ON AGODA! "It was great and perfect." Have a question for The Blossom Resort Danang? "I really appreciate the all staffs in the Blossom Resort Danang." "Very luxury, quiet and independent room with natural surrounding." "I really enjoyed this accomodation." "Staff were very kindly and helpful Always have beautiful smi..."
Located only one kilometer from Dragon Bridge, The Blossom Resort Danang welcomes guests with an outdoor swimming pool and offers scenic views of the lake. Rooms are luxuriously furnished and fitted with free Wi-Fi access. 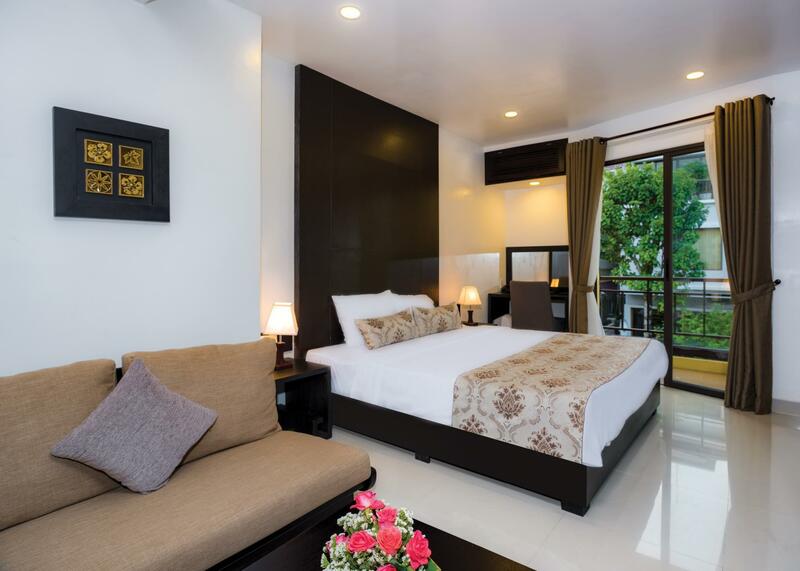 To explore this vibrant city of Danang, the property provides free shuttle bus service to popular places and other recreation centers in the city, where guests can enjoy the local Vietnamese cuisine as well as other international delicacies. The property offers 3 exclusive bus lines: the daily tour, the night tour, and the Marble mountain-Hoi An tour. Friendly staff at the 24-hour front desk will be able to assist you with the shuttle bus services. For a more relaxing experience, guests can indulge in some spa treatments at the spa and enjoy the complimentary Japanese Hot Spring and Sauna. The property also offers complimentary unlimited Pho (Vietnamese noodle soup) that will be served from 09:00 PM to 11:00 PM every night. "Really nice resort if you want to choose a resort beside the..."
Stayed in Villa C for birthday trip. Room was great, nice verandah, huge bathroom - with sauna! Shame verandah had to outdoor lighting, and vegetation could do with a trim... looked a bit wild, almost jungle like between our verandah and the koi pond... breakfast a bit limited. Free shuttle bus down town, 10 mins or so. Nice onsen , both male and female. Staff was pleasant and helpful. Was given a free birthday cake, pity they got my name wrong! The hotel is very relaxing and spacious with onsen. It also offered free foot massage and beef pho for us. The staff is helpful and nice. Highly recommended. Our room was upgraded with no additional charge. The staff is very friendly. The breakfast was stunning and is the best meal we had in Da Nang. Free shuttle bus to Hoi An and city save us some money. Free foot massage is good and relaxing. Free onsen and sauna is good enough for relaxing. Would definitely recommend to friends and come back again! Very worth of money. Everyone in the hotel are polite and always have a smile. The hotel itself is not close to any sightseeing place. But not a problem as you can take taxi or uber easily. The outdoor hot spring and free shuttle to Hoi An are also great. Stayed for 7 nights - Premium type room and villa(single-family house), most of staff were friendly some of them very skillful, most of staff could speak in English, breakfast and dinner restaurant was good with a wide variety of choices, convenient to use free shuttle bus, last but not least free night time phos and 30 mins foot massage every day were unforgettable. This is the best place to rest with family. All of things are good, but you have to use a taxi to buy something to eat. Really nice resort if you want to choose a resort beside the river! Quiet and comfortable resort when staying in blossom resort ! They Have spa, massage and sauna.. it’s so relaxing to do sauna and massage here after touring some place in the morning ! Nice service and polite staffs, overall it’s good. Highly recommend! Some parts of building could do with some minor improvements but staff are simply wonderful. The menu has very limited food but quality is not bad at all. 1. I was so happy that there is good staff who can speak Eng. so we could comunicate 2. Free foot massage and free night meal made our trip satisfactory :) 3. Since it was rainy season, the room was a little humid, so I mentioned inconvenience about it, they took care of it immediately. There is nth to complain about overall. The shuttle bus service they offered is quite convenient and can save money for transportation. The unlimited complimentary Pho (noodle) from 9pm to 11pm also made us to save money from supper. The swimming pool with very beautiful background of sunwheel is amazing. Stuffs are also very helpful and nice. They provide big bottle of bath gel, shampoo and conditioner. It is very good for me bcos I always use alot of soap and conditoner and never enough with what they provided, I have to bring from my home. Quality of shampoo and conditioner is so very good (I wanna know which brand they use) not like other hotels, made my hair so soft after washed. They also offered complimentary welcome fruit plate. One bad thing is very small bed. We two couldnt even move side on bed. Its full when we lie on bed even though we are petite. Room is kinda small. The toilet bowl is cool with many functions. Shower and bath tub separately. It was great and perfect. Its such a beautiful hotel with cozy garden and riverview. Staffs were very helpful and kind so there was nothing uncomforable at all. I booked the villar, it was quiet big and super clean also. Its so great to be a bit away from the city(5mins by car) cuz i could have quiet and peaceful morning not like other hotels which are surrounded by all the crazy cars and noise from construction sites. I rly want to stay this resort again next time i visiy vietnam. Had a great memory there! It is located far from center of city a little. but you can reach the hotel by taxi anywhere. my room(standard) was small but cozy and clean condition. hotel's garden is good especially when the weather is sunny. and the pool will give you good view point at the morning and night either. price is reasonable. lastly, all staff are gentle and kind. I'll recommend this hotel to my friend when they has plan to go to Da nang. Nice rest and relax resort. Amazing poolside view. Good massage and best outdoor onsen. Great breakfast. Free hourly shuttle to city. Free transportation to Hoi An. Chi, the reception staff is great in recommending local eating and visit places. I came to Da Nang for 2 nights, went to Hoi An for 2 nights and came back to Da Nang for 1 night before flying back to Malaysia. Decided to relax in a resort as my previous stays were in hotel. I booked a room and was surprised to received free upgrade to villa. This resort located on a tiny, quiet island with it's restaurant and swimming pool facing Asia Park. Ride is required to go to the beach. There was a complimentary Vietnam noodle soup supper. Breakfast was great, small volume with many choices. There were not much guests during my stay, I enjoyed the whole spa by myself in the afternoon. Wonderful staff, very friendly and helpful. I enjoyed my stay here. I walked into peaceful resort style hotel with a Japanese onsen/hot spring and massage that soothes my tired body. The swimming pool overlook the giant feris wheel beside the river. Lots of greenery surround this property. Staffs and manager are very helpful and very eager to please. Free shuttle to My Khe Beach and casino. The restaurant serves delicious food and breakfast was great. Room is comfortable and clean, shower area is big with bath tub, and the toilet seat comes with finger touch bidet one would find in Japan. All in all, I would recommend this hotel to anyone who likes a relaxing stay. Staffs are friendly and helpful. Breakfast was okay, but did not have many choices. We enjoyed free Pho during our stay.